Have you ever felt stuck in your life? Ever felt like you don’t like how your life has turned out so far? Ever wished something in your life would be different? And when someone asks you “How are you doing?” have you ever answered with “fine” even when deep down you know you’re not fine? I have been there. And as I grow older and into adulthood I realize more and more that this seems to be an epidemic of modern adult life. We have so many choices, so many opportunities, so many things at our fingertips – and yet we are often bored, stuck, and wondering if we should have made a different choice. Wondering how to make our lives better. Wondering how to find fulfillment. As a post-grad, this reality typically hits really, really, really hard. And yet no one prepares us for that. It’s easy to feel completely out of control during the times when an area of your life isn’t where you want it to be. However, the truth is, you actually have more control than you realize. And that is what the book Stop Saying You’re Fine, by Mel Robbins, is all about. 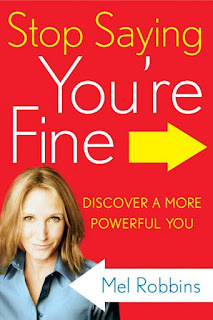 Mel Robbins is another one of my non-fiction mentors whom I’ve never met (previous ones I've written about include Wes Moore and Darren Hardy), and I hope you’ll consider inviting her wisdom into your life too by checking out her book. 1. In almost any context, watch how little kids act versus adults. You will always learn something. Mel points out a time when she watched adults and kids doing yoga (p. 92). During the tree pose (a pose where you stand on one foot while the other rests on your calf), the adults remained tight-lipped and clenched. The kids got a kick out of falling out of the pose and trying again – that was the best part to them. As we get older we are so focused on getting it right/perfect. Kids never feel “stuck” or “bored” in the same way we do when we’re adults. Why? Because they are constantly exploring and have a shamelessness about them that often gets kicked out of us around middle school. Embrace that sense of experimentation and exploration, and don’t be afraid to tumble. 2. Being uncomfortable is a good thing (p.97). And the hardest part about enacting change in our lives is making that first step and fighting our brain (which tells us uncomfortable is “bad”). For example, my brain tells me every day not to work out. It tells me it’s boring, that I have other things to do, that it probably doesn’t make a difference any way, and that it is too hard and painful. If I listened to that part of my brain, I would never exercise. I also know that exercise is really important for my health. But often, the former part of my brain wins and I skip out on exercise. This book really transformed my thinking and reminded me that being uncomfortable is a good thing, and that most things worth having often require discomfort. I would never “want” to work out. Just knowing that helped me push through, and ever since I started reading this book a few weeks ago I’ve worked out every single day (something I’ve never done before in my life). It’s amazing what a simple change of mindset can do. And this book will give you so many ideas of how and in what areas of life you need a mindset shift. The results will blow you away. 3. Once you admit that you are not fine and you commit to overcoming the part of your brain that wants to keep you comfortable, stagnant, and "safe," it is time to figure out what you want. Mel explains that you must write it down and put it somewhere you can see every day (I also teach this in my goal-setting workshop). This is more powerful than you realize. If you take any action from this post, I hope you: #1 buy Stop Saying You’re Fine/reserve it at your local library and #2 write down one goal that you have for your life and put it up in your room. The rest of Stop Saying You’re Fine will teach you how to enact change in your life every day and move towards the life that you really want but are often to afraid to talk about out loud. It is possible for you. It really is. You have more control than you realize. We all need a reminder of that constantly, and this book is a great one! Robbins, Mel. 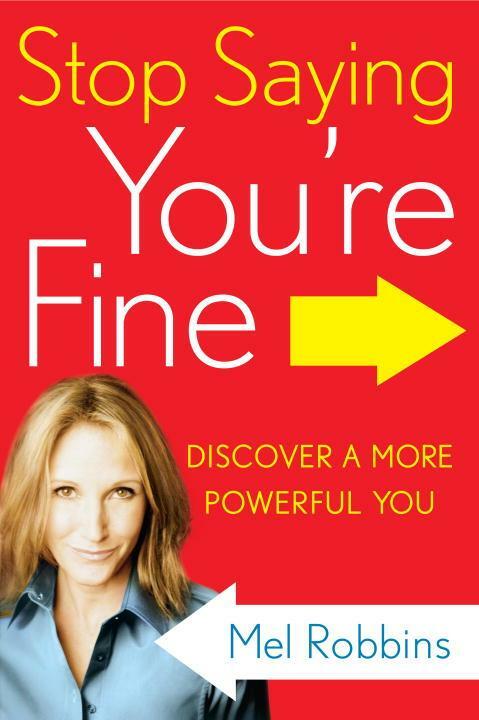 Stop saying you're fine: discover a more powerful you. New York: Crown Archetype, 2010.